Enjoy a Morning Beach Yoga or Sunset Yoga session in the most serene setting of the famous Waikiki beach oceanfront- an area for the most stunning sunset oceanfront views as the view of Diamond Head Crater serves as your backdrop. Our classes are designed to provide visitors with their moment of focused stillness - to truly see and feel what is truly Hawaii. Away from the hustle and bustle of the Waikiki hotels you'll enjoy a more connecting experience to Hawaii's land and nature as you mindfully watch trees and clouds sway and surfers coast the waves. Classes are all levels and many visitors take this opportunity to try yoga for the first time. Morning classes tend to be a bit more quiet and calm in the park, so the classes tend to be more of a gentle and relaxing flow while the grand banyon tree provides a calming shade. Private beach yoga and yoga hikes also offered at secluded areas of wild nature throughout the island, including nearby Ala Moana and Magic Island. We are a professional premium yoga offering in the most authentic training and goals- in fact we are so elated to be the highest rated beach yoga offering in all of Hawaii for the last 5 years. We understand we need to ensure excellence in every single offering as we know many visitors only have limited time and maybe just one chance, so we want to ensure the best experience possible. All instructors are highly experienced with years of teaching and training in the authentic mindful intended flow directly as it was taught in India where the founder was trained. Only the best, most experienced instructors on island are hired and then honed into the mindful connecting flow we are rated so highly for. (we know that many teachers are not experineced in teaching all levels in one class or understanding fully the considerations needed for reliably great yoga session outdoors) We work to constantly to develop and maintain our ranking as the best beach yoga in town, and the most unique and most epic yoga experience you can find. Designed to connect people with the spirit of our islands and the aloha within our aina (land). We have extremely high standards and quality control, with expertise and experience teaching all levels at the same time in the outdoors...to ensure that each class is an excellent one for everyone. We know you have limited time on our islands and our goal and specialty is to make sure that each class is the best possible Hawaii yoga experience you can have for your travel time here. The mission is to spread seeds of mindfulness...so within our goal is the Hawaii people's goal for travelers to have an authentic understanding and enriching view of us and our place here also. The classes generally honor ashtangas principals and embrace evidence based mindulness in a vinyasa flow that can be dynamic or slower in accordance with the groups levels and energy. 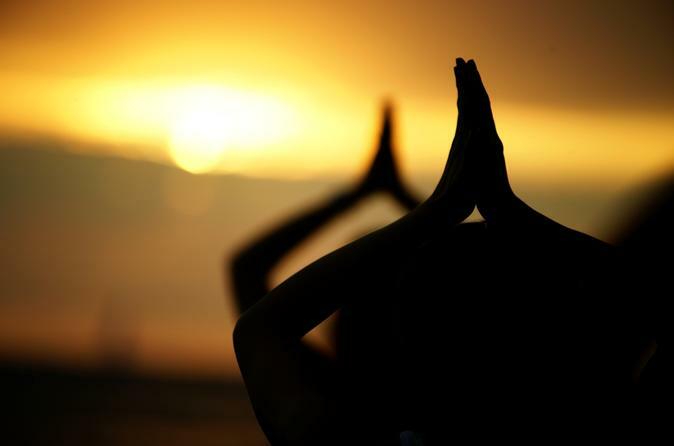 All levels - we have many first timers to yoga as well as those who are more experienced. The atmosphere is very relaxed, warm and friendly with everyone in deep focused appreciation of the stunning nature that unfolds throughout the class.